"HTC often likes to highlight "firsts" in its marketing messages. While the days leading up to the launch of HTC's Arrive are noticeably devoid of any relevant advertising, Sprint and HTC could have easily kept the "first" theme alive had they chosen to raise awareness. The Arrive is Sprint's first device to run Microsoft's Windows Phone 7 mobile operating system. In fact, it's the first modern Windows Phone in the world compatible with a CDMA network. Finally, HTC's Arrive is also the first phone to launch with Microsoft's "NoDo" update for Windows Phone 7 - a prerequisite for CDMA compatibility. But do all these firsts add up to a first-class smartphone experience, or are Sprint customers better off waiting to see what's announced next week at CTIA before making any buying decisions?" I'm very excited to finally see CDMA devices for WP7, and we expect to see Verizon jump on board in the next few weeks. But I'm concerned that Sprint has chosen a physical keyboard for their only option. Most people love the onscreen keyboard in WP7 and are looking for smaller, slimmer devices. I can only hope that they quickly add other options to their line-up very soon. People like variety. I think that's been the biggest problem with T-Mobile's rollout. Just one option in the HD7. Kudos to AT&T for bringing in three different manufacturers with HTC, Samsung, and LG and a variety of form factors. This leaves me asking two questions. Is there a need for a physical keyboard anymore? If so, what do you primarily use it for? If not, does Sprint have another Windows Phone coming down the pipes? Tell us what you think. 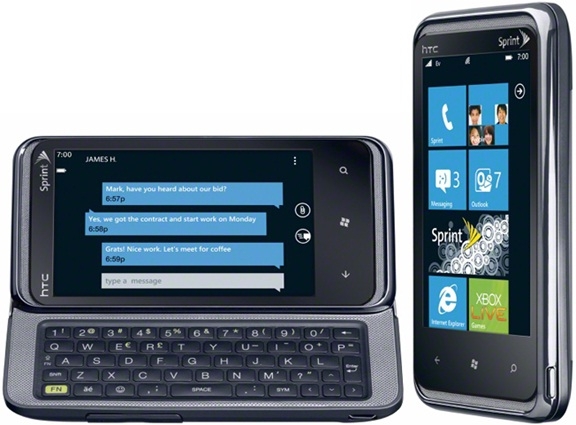 Rumor has it that two more WP7 phones will be coming to Sprint in the next few months. A Samsung Focus variant and an HTC HD7 variant. To my tastes I think both are better options than the Arrive. I just don't know if I can hold out any longer, especially considering that theses phones have yet to be verified. A longtime WM user (6 years on PPC 2003 2nd Ed because the Audiovox XV-6600 was the last device with a full-sized screen until recently), I used (still do, but not as much) the Fitaly on-screen keyboard exclusively, even though the XV-6600 had a thumboard slider at the bottom, which I scorned. Then I moved a year ago to the HTC TouchPro 2 and discovered the joys of a slide-and-tilt ASCII keyboard that automatically puts the device into landscape mode. A microlaptop form factor allows it to be my bedside alarm clock with the screen up and tilted. My only gripe with the TP2's keyboad is its lack of a Ctrl key - for that I use the Fitaly - but it lets me work more quickly than with an on-screen keyboard if I want to enter text quickly and accurately - particularly important for password fields, where you can't see what you're entering. I'm just pleased to see that HTC hasn't completely abandoned the slide-and-tilt form factor after the TP2 left the marketplace. Is there a version for Android? I've given up on Microsoft - once WM is truly dead, I'm heading over to Android - I have no patience for Microsoft's aping of Apple's mistakes with the iPhone's first generation. A walled-garden for software? No cut and paste? Are they kidding?